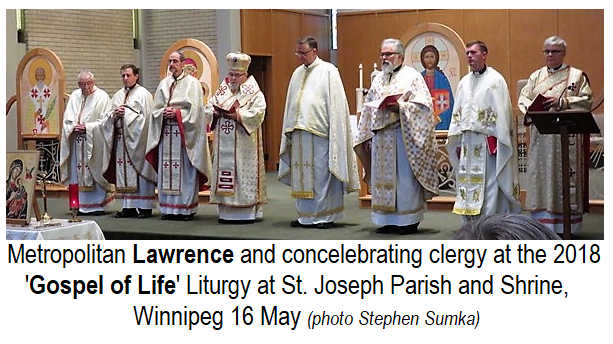 The Archeparchy of Winnipeg hosted the annual Gospel of Life Divine Liturgy this year at St. Joseph Parish Church in Winnipeg. The Knights of Columbus have been organizing the event for many years now, around the time of Canada's annual March for Life. Starting a few years ago, the 'Tri-diocesan Committee for the National Week for Life and the Family', decided to have each of the three jurisdictions host it each year. Last year it was hosted by the Archdiocese of St. Boniface, the year before - by the Archdiocese of Winnipeg. This year, once again, the Archeparchy of Winnipeg had the honour of hosting the event of prayer and fellowship. The Redemptorist Fathers agreed to host the event at their Jefferson Avenue location in Winnipeg. The well-known facilities are home to the Redemptorist Fathers' Canadian Provincial House, St. Joseph Parish Church and the Blessed Vasyl Velychkovsky Martyr's Shrine. Therefore the event became not only a Eucharistic Liturgy "for life", but a pilgrimage for all who attended. Prior to and after the Hierarchical Divine Liturgy, participants were invited to visit the Shrine - that includes a tour, a museum and chapel where the holy relics of the saintly Bishop and Martyr Blessed Vasyl (Basil) are reserved for veneration. Following the Divine Liturgy, everyone was invited to come forward for an anointing with the special holy oil of the Shrine. A half hour before the Divine Liturgy, the Knights of Columbus under the direction of the Knights Culture of Life Director Brother Tim Scatliff, lead the Holy Rosary in different languages. 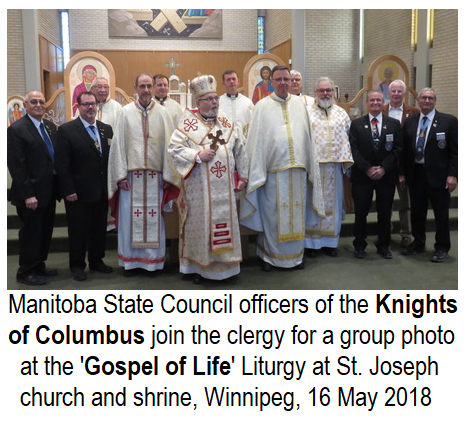 Manitoba State Deputy of the Knights of Columbus, Bro. Dan Shepherd, and other state officers were in attendance. Fr. Dmytro invited everyone to come down to the reception hall for some refreshments. Most did and they were not disappointed! The ladies of the parish prepared a wonderful buffet of cheeses, fruits, cakes, punch, tea and coffee. In fact after everyone settled in, they gladly stayed chatting, making and renewing friendships. They did, after all, already have something fundamental in common - their love for life and their willingness to come together to witness and to pray.